After Meeting the Murderhobo, What is Your Favorite Multiclass Combination? 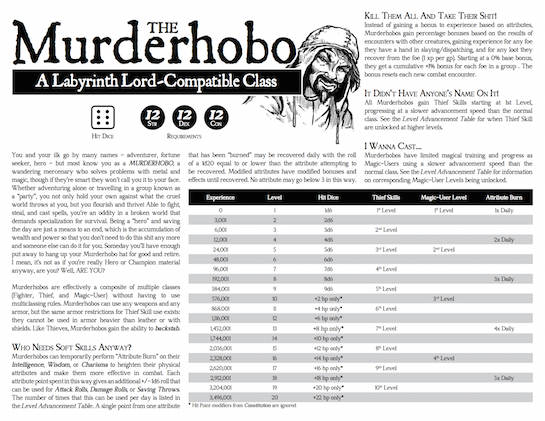 So, we met the Murderhobo yesterday (although written for Labyrinth Lord, he can easily be used with any OSR system to derail most any campaign ;) and it got me thinking about multiclassed characters. For me, my favorite multiclassed characters have either been the straight up Cleric with a high strength (allowing him to be a very effective fighter up to at least mid levels) or the Magic-User / Thief. There is an awful lot of synergy between magic and thievery. Both classes tend to avoid front line (or any line) of direct combat. Actually, if were playing with gnomes, Illusionist / Thief might have even better synergy than MU / Thief, especially if one is looking to enhance their thievery side. Never saw much of a need for a Fighter / MU and Cleric / Anything is pretty useless, as a cleric is pretty much a spell casting fighter in any case. So, what is your favorite multiclass combination? Way back in 2013 I wrote a post about The Grande Temple of Jing Kickstarter. It was to be the bestest, most amazing megadungeon ever produced - at least best of any based off of a 2001 release of a 40 page adventure for D20. You too can turn 40 black and white pages into a 300+ page full color hard cover. It might just take 2 years longer than you expected. In any case the new, improved The Grande Temple of Jing released at GenCon this year. Two years later than estimated (August 2013). I never backed this one so I completely forgot about it until I was poked by a reader. 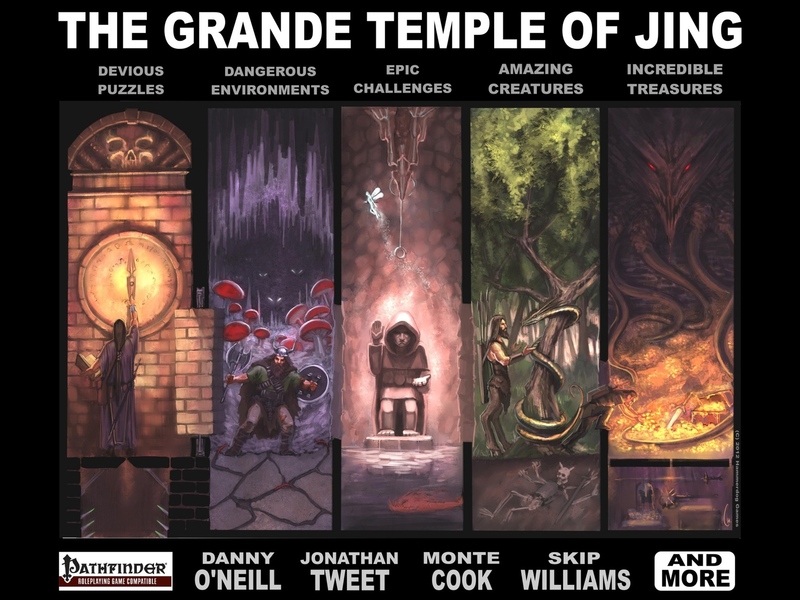 The Grande Temple of Jing is the dungeoncrawl that rules them all. It is a megadungeon designed in the spirit of old school games, but with modern rules and sensibilities. 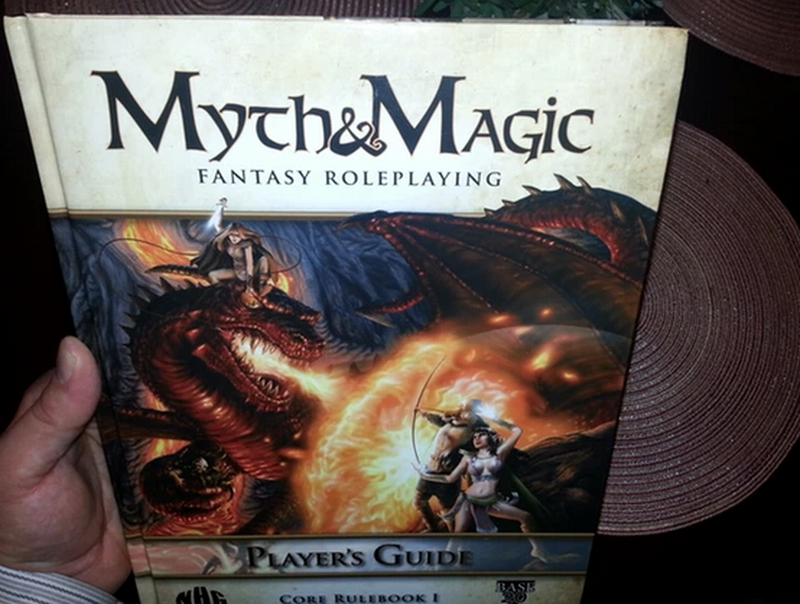 It is presented here for the Pathfinder system, but it can be modified to play with your favorite fantasy RPG. It is designed for levels 1-20 but if this Kickstarter reaches its first stretch goal, then we will add content for epic level characters as well. A part of the grande temple was originally published in 2000 as a thin, digest sized book, compatible with the d20 system. 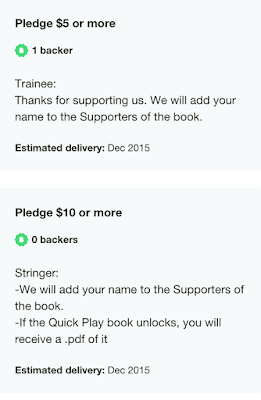 With your help we will update, upgrade, and MASSIVELY expand that book. In effect, we will make it the adventure it was always meant to be. Our goal is to create a full color hardcover tome that any roleplayer would be proud to have on their shelves. Professional production will ensure that retailers can display the book confidently on store shelves. So yeah. 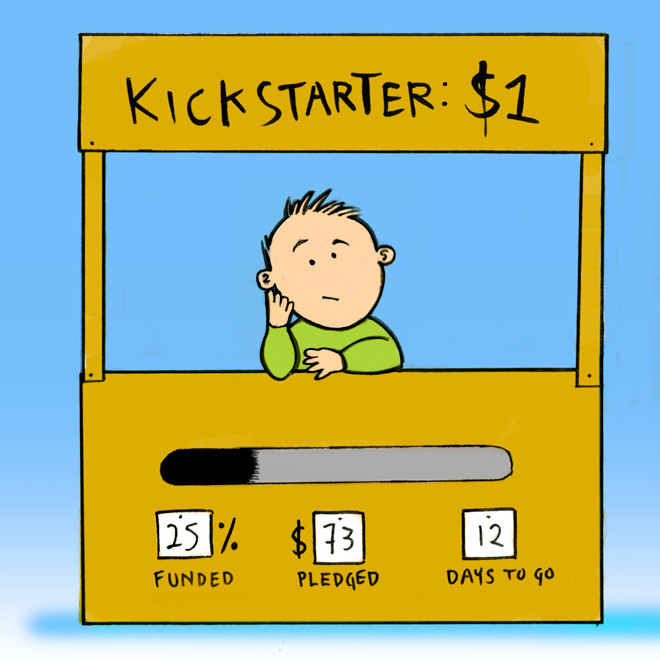 The first rule of a successful Kickstarter is have 90% written before kicking. 40 pages of a 300+ page book puts it around 13% written when kicked. 12 celebrity creators and fan submissions didn't help. Strangely enough, the deluxe Tunnels & Trolls kickstarter will also be shipping books soon. It's estimate shipping date? August 2013. Now finally you can play an actual Murderhobo in your murderhobo games! This new class for Labyrinth Lord lets you hack and slash with the best of them while being able to be sneaky and sling spells! Ostensibly a multiclassed Fighter/Thief/Magic-User, this class literally gets away with and benefits from murder! Multiclass without needing multiclass rules! Kill your enemies with brute force, sneakiness, or even full-on magic to the face! XP bonus increases with every kill! Sacrifice your smarts and social skills to give yourself the edge in combat! Talk your way out of all the death and destruction you leave in your wake! Three variants: the Low Templar, the Deathblade, and the Strider! WARNING TO GMS/JUDGES/REFEREES: This class isn't recommended for actual use in any game. Unless you let EVERY player use this class. And then there will be shenanigans. You've been warned. As I adjust to the new work hours I'm realizing that trying to host Tavern Chat from 830 to 10 PM on a Wednesday Night when I get off work at 1005 just isn't going to work. Yeah, it's kinda obvious, but I can be dense. So, we're moving the hors to 10 PM to Midnite, still Wednesday nights. Now, I won't be home until about 1040 or so, but as folks tend to arrive early it should still work. I'd also like to add in a Friday morning Tavern Chat once a month or so for those in the more distant time zones - that would be 10 AM to Noon, Eastern. More on this soon. Probably won't kick off until September. I'm usually available in the mornings from 10 to noon if someone needs to raise me on Google Chat or Facebook Messenger. There are some night's where I actually get to sit down and have a meal (and therefore access my phone and Tavern Chat and the like) and other nights that are just non stop. I'd push it to 1030xMidnight if folks were agreeable or y'all can simply chat amongst yourselves. You don't need me to keep the tradition going, though I do miss it when I am absent. 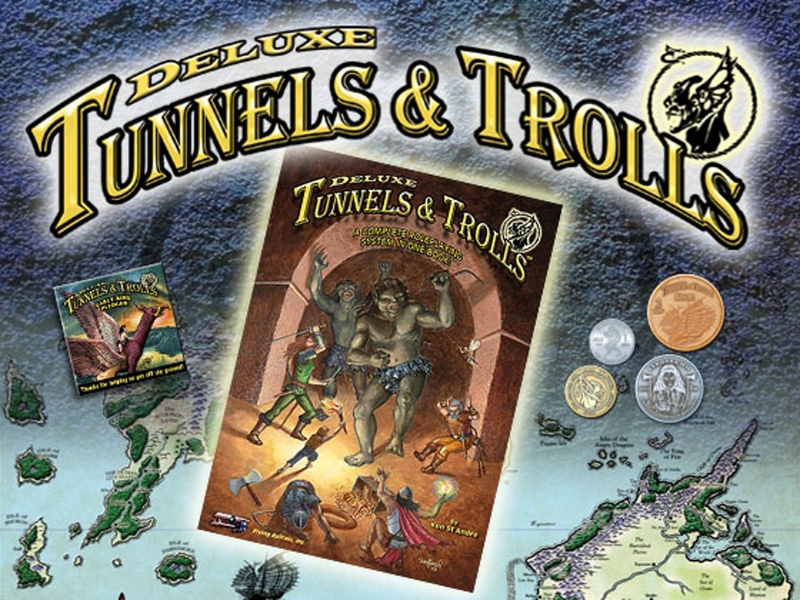 In case you missed it, Deluxe Tunnels & Trolls Kickstarter had an estimated release date of August, 2013. Now, I'm I know I'm going to get flack for this but releasing the rules in PDF earlier this summer does not constitute delivery. Nor does shipping out adventures and pencils and other filler. The latest update (just a snippet) - "Friends: During our kickstarter, we promised you all a pdf of a GM screen for Deluxe T&T. It is now done, and available from Drivethru using the following link: (link not included obviously)... 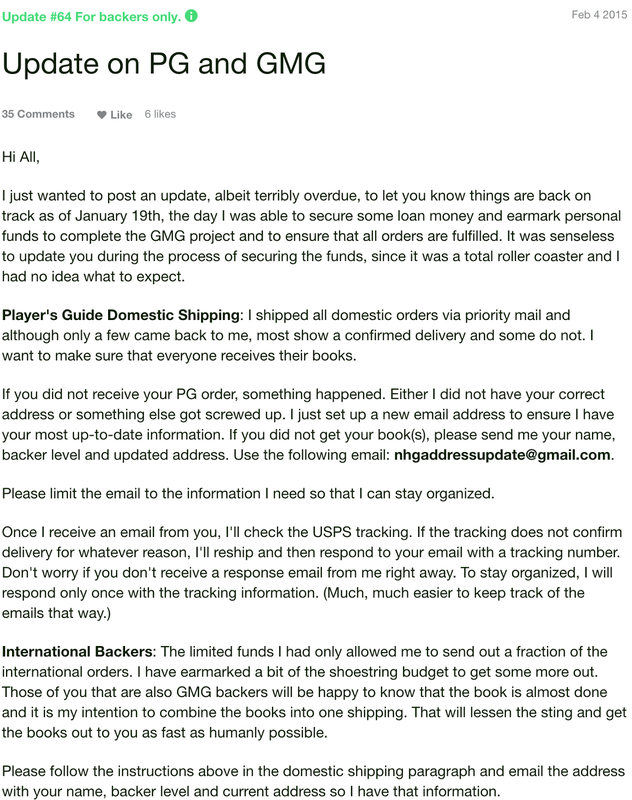 The hardcopy of the GM screen is now at the printer, and those of you who paid $5 for a hardcopy will be getting it soon." We missed summer of 2013 (not a surprise and wasn't really expected) and summer of 2014 (where I was hopeful) and now summer of 2015 will be passing us by. You folks are frigging awesome! $505 given by Tavern readers thus far. 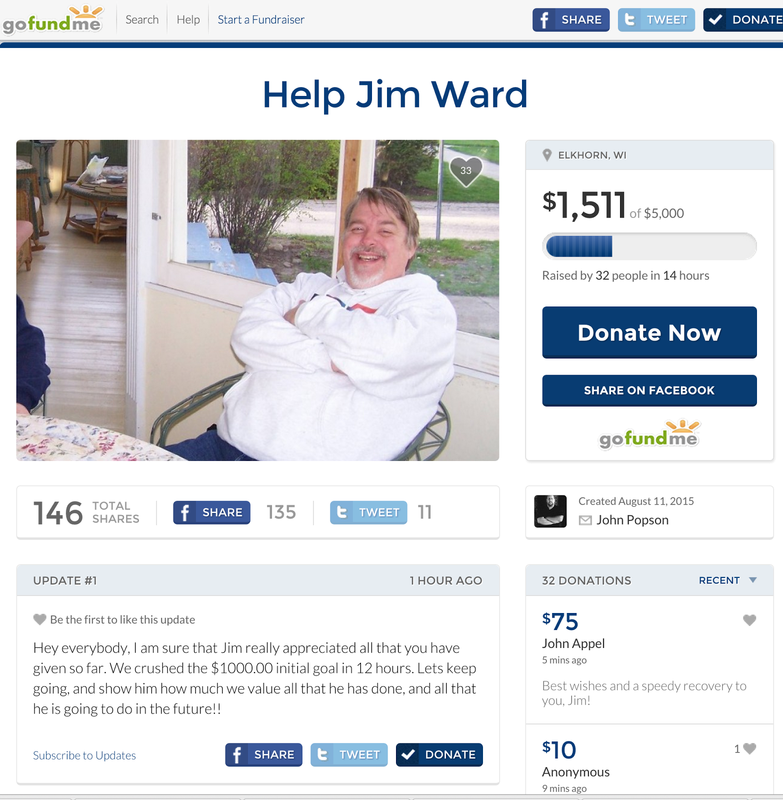 Keep giving to Jim Ward folks. First things first - here is Jim Ward's GoFundMe Page for help with his medical bills. This is what The Tavern is going to do. Any Tavern Reader that donates to Jim's medical bills at the above site needs to post the amount they donated in the comments here. 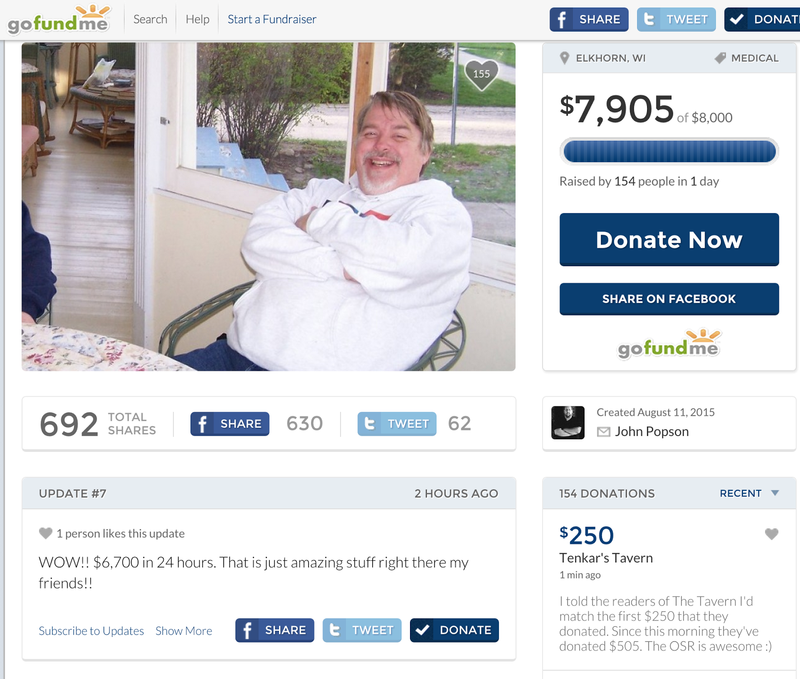 I'll match at least the first $250 donated by The Tavern's readers. Each night I'll tally up the day's donations and will match that day's total up to $250 for the entire campaign. I may go beyond that, but I'll need to look at Friday's paycheck. Jim Ward has been an icon of gaming for almost 40 years. From Metamorphosis Alpha, to Dieties and Demigods, Greyhawk Adventures and countless other supplements - he's been there practically from the beginning. "Got terrible news today. I need lots more hospital time with several more foot operations. How am I ever going to get work done in a situation like this. Bills are mounting and I have to be home to get much work done. I don't remember when I have been this miserable." I want to help. I'm not a rich man - but I do have something to give. 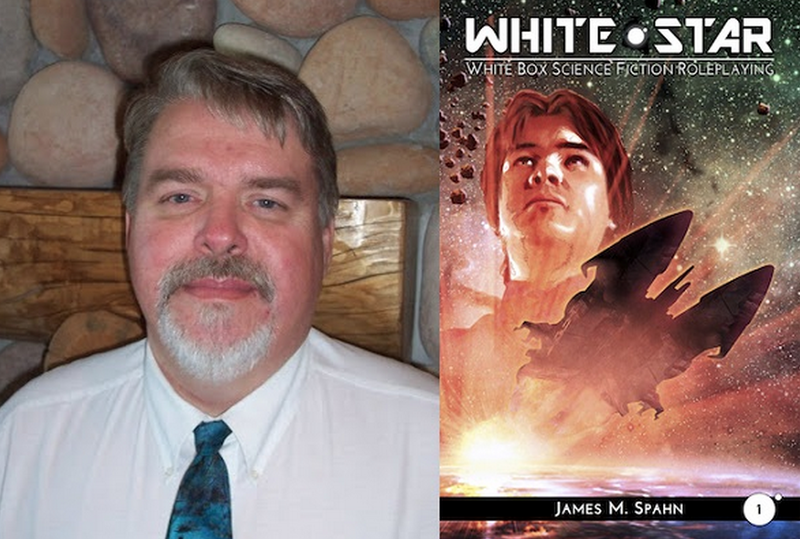 I have two print copies of White Star: White Box Science Fiction Roleplaying. They are proofs, with errors. Author's notes are in the softcover. There are literally only two copies of these books in the world and they will never exist again. I'm auctioning them off, with 100% of the money raised going to help Jim. If you'd like to bid, simply send me an e-mail at JSpahn1978 (AT) gmail (DOT) com. Put "Jim Ward Auction" in your subject line and simply tell me your bid. Each book must be bid on individually. The bidding will be open until Friday, August 21st, midnight Eastern Standard Time. Payment from the winner will be made via paypal. This auction IS open to international bidders, though all bids must be given in US dollars. Let's do something great for Jim, guys. 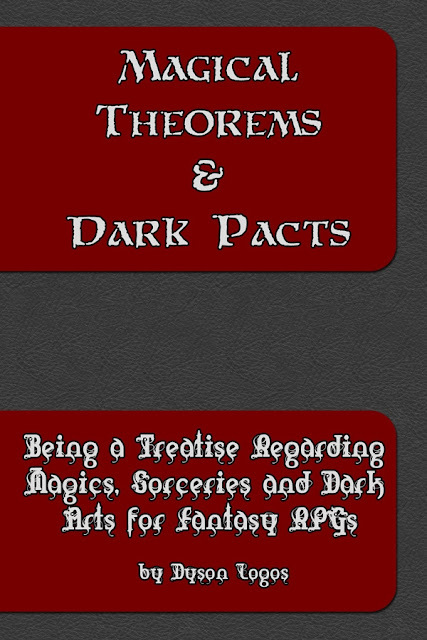 Magical Theorems & Dark Pacts (just 3 bucks for the next 23 hrs or so) contains everything you need to run a spellcaster in Labyrinth Lord and other basic fantasy OSR games. 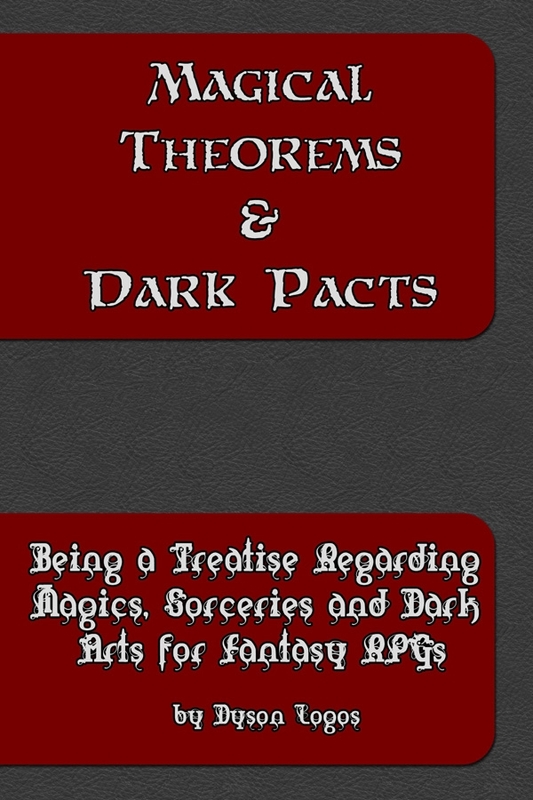 For completion, this tome includes the three core spellcasting classes, and adds ten more, along with full rules for all their assorted spells. All the spells for all these classes are included (including the core spells from Labyrinth Lord). 28 pages of new magic items generally aimed towards spellcasters (with a few sneak ones thrown in for the Unseen). From new and unusual potions to exotic rings and a collection of new figurines of wondrous power, this chapter also focuses on making magic items unique in your game - avoiding the pitfalls of every campaign having the same gauntlets of ogre power and rings of protection. Just a few monsters in this short chapter – one referenced earlier in the book and rules for summoning & conjuring alternate types of elementals (wind, crystal, dungeon, wave, moss, thorn, smoke, zephyr and so on). If there is one of those new fangled RPG systems I'd like to play with, it's Ubiquity. To my aging eyes and sensibilities, it seems like a much streamlined and simplified Savage Worlds. Not that I have anything agains Savage Worlds, as it does have some excellent setting books. It just seems to me that the rules are ore complicated than they need to be. Maybe it's more accurate to say they are more complicated than I need them to be. I've been intrigued by the Ubiquity rules ever since I stumbled across Hollow Earth Expedition. Which of course makes Quantum Black even more intriguing to me. So, what is Quantum Black? 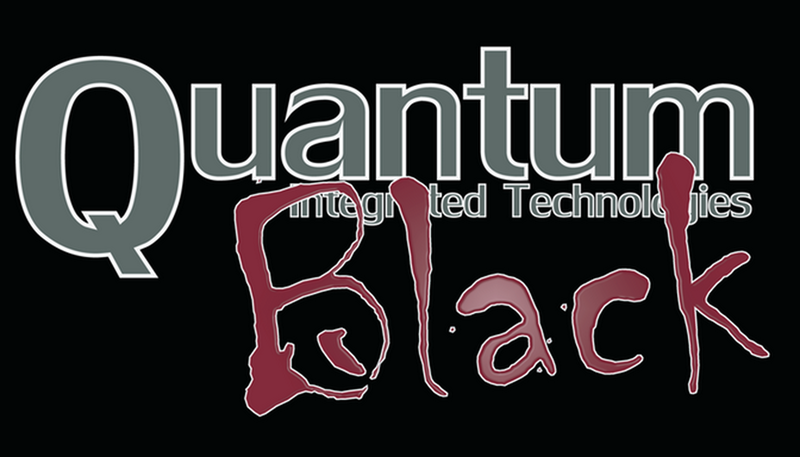 The Quantum Black setting is a modern day action-horror roleplaying game in a world much like ours. However, hidden supernatural threats are growing. Evil cults, horrors from beyond space and time, and other monsters all rise to terrorize the world. Someone needs to stop them. In the Quantum Black setting, you play an employee of Quantum Integrated Technologies. You are on a secret black ops team that is out to save the world from a rising tide of unimaginable horrors. Equipped with the best weapons, cutting edge electronics, and various drones you will board the company jet to track monsters down to save the day. You are prepared for anything–or at least you think you are. You can have hours of fun stopping monsters and still keep your sanity intact. Quantum Black is a story and action driven setting that is powered by the award winning rules of Exile Game Studio’s Ubiquity Roleplaying System. The contents are compatible with other Hollow Earth, Ubiquity-powered games. Then I look at the support levels, and I'm left scratching my head. So, if the Quick Play doesn't unlock (and Quick Plays are usually free in PDF but not here) you spend $10 for no reason. 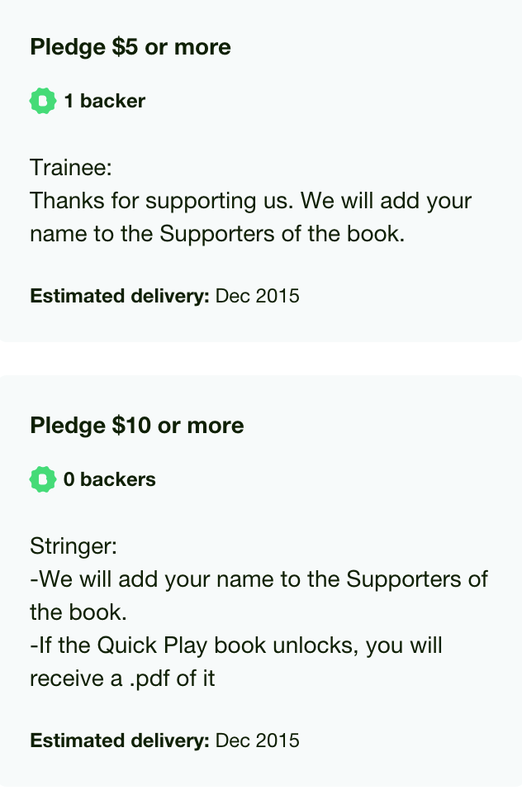 I see why the option has no backers. $20 for a PDF with no stretch goals. That's steep in my opinion. 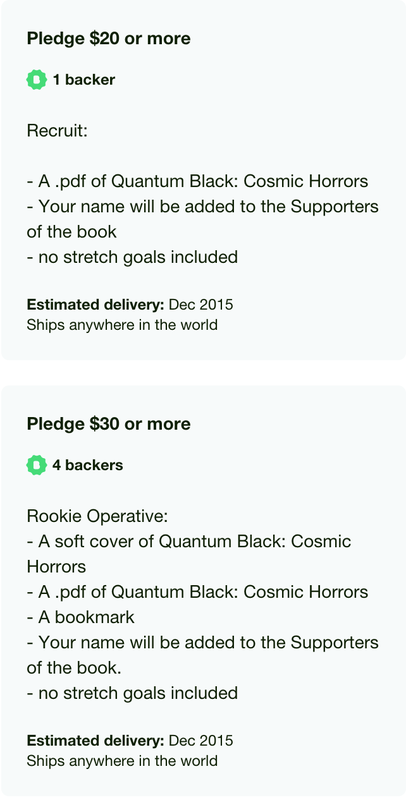 $35 for a PDF WITH stretch goals, which may or may not be met. Yeah, er - no. 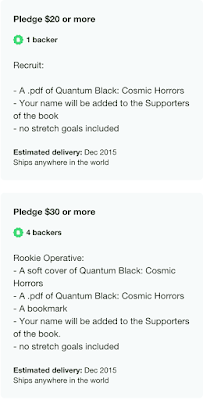 $40 for the Soft Cover, PDF and stretch goals in PDF. So, print is only 5 bucks more? Oh, and Hard Cover is just 5 bucks more than that? Oops, make that 10 bucks more now, as $45 has sold out. My math only accounts for $3,330 in backing - leaving $3,000 in unaccounted for funding. Not a good sign. Damn me and my vetting! +James Spahn 's White Star RPG has crawled back to the #1 Hottest Title over at RPGNow. It's been unseated a handful of times but always seems to reagins the spot. Green Ronin's Fantasy Age (I want to call this a generic fantasy version of Dragon Age, but I suspect that is a simplification) is the most recent title to bump White Star, only to lose the #1 position to the very product it bumped. Which reminds me. I need to do some more White Star content. Another product with long life on the hottest sellers list is the Creature Compendium by +Richard LeBlanc , which has been hanging on since early April. I regret to inform you that one of our servers suffered a security breach which may have compromised your credit card information. You are receiving this email because you made a purchase (or attempted to make a purchase) on our site using a credit card between July 6th, 2015 and the morning of August 6th, 2015. There is a 50% chance that hackers were able to collect your credit card information. We recommend that you contact your credit card issuing bank and ask them to replace any cards that you used for charges on our site, and also look over your most recent statements for any suspicious charges. Our technical team has identified the issue and has secured our servers. Our websites are once again safe to use. Information such as your name and email address were potentially compromised as well. Login passwords are stored encrypted with a one-way hash and cannot be decrypted. You do not need to change your account password, but you are more than welcome to do so on your Account page at any time if you wish. We are truly sorry this incident occurred and sincerely regret the inconvenience it causes you. Navigating credit card company call center menus is no one\'s idea of a good time. Security has always been our top concern and up until this incident we were proud of our security record at DriveThruRPG.com. We will continue to do everything we can to keep our marketplace secure going forward. As I sit at my desk brainstorming for the article I owe Old School Quarterly on the subject of RPG Kickstarters, it occurs to me that the perception of Kickstarters in our corner of the gaming universe is defined like much of the public's perception of law enforcement is defined - by a handful of bad apples in a very large bushel. 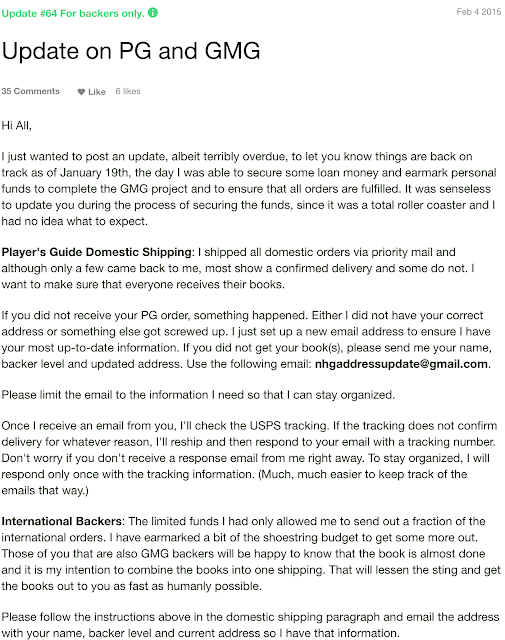 Failures, fuckovers, pyramid schemes and the like are relatively rare in the world of Kickstarter. The vast majority of successfully funded projects ship quality products. The +Kevin Crawford s (where you get the beta PDF the moment you back), +Joseph Bloch s, Melia Valors (PDF less than 3 weeks after completion), the Reapers, the Frog God Games, the Goodman Games, the Monte Cooks, +Pete Spahn s, +Peter Regan s, the Dwarven Forges, +Lloyd Metcalf s, The Steve Jackson Games, +Newt Newport s, +Lesser Gnome s, +michael mindes, the Troll Lord Games (edit more better damn you!) and many others wouldn't be producing the quality products they are if it weren't for Kickstarter. The Gareths, Nysuls, Whitmans, Brave Halflings and a few other bad apples each define their failures uniquely. There is no singular path to failed success. In any case, the articles for OSQ will need to find a balance of exposing the bad while highlighting the good. In retrospect, I think I need to find a bit more of the balance here at The Tavern. Wayward Kickstarters - Myth & Magic Player's and Gamemaster's Guides - A Pair of Pink Elephants? Now, I know the guys at NTRPG Con got one copy shipped to them just prior to the 2014 Con that June. The problem is they paid for four copies. As of June 2015 the rest of their copies still hadn't shown. But hey, we know the copies exist, right? We have a picture of the book from March 4th, 2013 and I actually received my copy (after Tom posted my shipping info in the Kickstarter comments section - bad Tom, very bad) and it didn't come with the expected anthrax or cat piss. It's actually a nice looking book that's well laid and would probably be a fun clone to play if it didn't come with all of the attached drama. Folks are still waiting on their copies over two years later. BTW, you can grab a copy of the M&M Player's Guide for $9.99 in softcover at Lulu.